After spending what we’re sure was the greatest night ever dancing the night away with her fellow Game of Thrones cast and crew members after the Emmys, Sophie Turner heads back to Northern Ireland today to get back to shooting Season 7 of Thrones. Here’s Sophie and BFF Maisie posing with a lucky fan in Belfast when they started filming last week. "Some crazy dragon stuff happens." Well, that’s a given, right? Since these next two seasons are shortened, they’ll undoubtedly contain CRAZY storylines. Sophie even told Access Hollywood that she actually CRIED after reading her scripts. "I did [cry], it was just like so [...] overwhelming, not even in like a sad way, I was just like, 'HOLY CRAP! I can't believe Game of Thrones is doing this and THIS is happening to the character!'" But WHAT is happening to the character – presumably her character, Sansa Stark?! Given the way things were left when we last saw her, does this mean something nefarious will happen with her and Littlefinger? Because the last time we saw Sansa and Petyr ~creepy~ Baelish, it definitely left a bad taste in our mouths. Although, REALLY, when isn’t Littlefinger involved with something questionable or downright awful?! We just hope he doesn’t actually force Sansa into marriage, because… UGH. 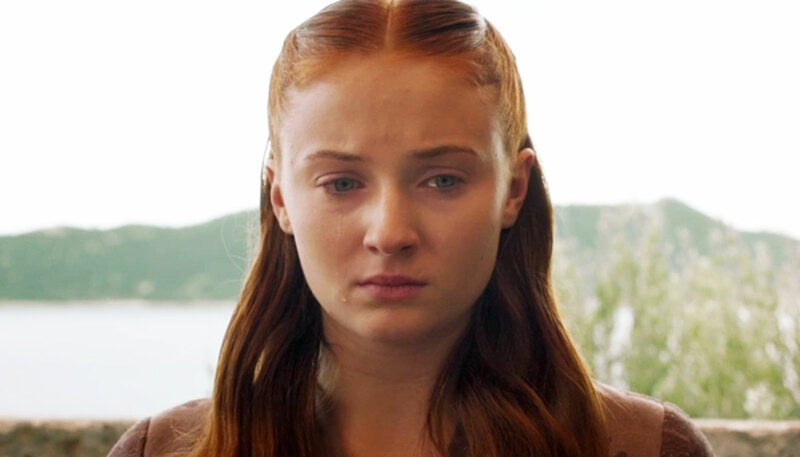 But, if we’re lucky, maybe this means something GOOD will finally happen to Sansa?! Will she takeover as QUEEN in the North, ruling Winterfell while Jon heads south to finally put an end to the viscious nightmare that is Cersei Lannister?! GAH there are just too many amazing options.